This is where you start your Nordic walking experience. 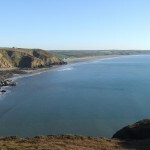 Nordic walk along the beaches, coves and cliffs of the magnificent Pembrokeshire Coastal path, with renowned storyteller and guide Andrew Dugmore. Your nordic walking tuition will provide you with comprehensive training which will include uphill and downhill techniques and walking along different terrains. Each day afte r the initial training period we will follow a 3 or 4 mile guided walk along sections of the Pembrokesire Coast National Park, led by our experienced nordic walking instructor( Andrew Dugmore, Pembrokeshire Paths) and tour guide. Hear tales of Celtic saints and ancient stones while walking along the inspirational landscape of Pembrokeshire. 2012 Coast magazine, recommends Pembrokeshire as being an area that is particularly suitable. On the first evening you will be greeted by your guide for the weekend who will then share with you “tales of the Celts” told in the authentic tradition of the storyteller. The holiday is subject to a minimum number of participants. Cost: £245 per person, bed,breakfast and evening meal with option to purchase a packed lunch. Arrive: From 4pm, Friday 8th April, for an evening meal at 7pm. Depart: After Tea and Cake at 4.30pm, Sunday 10th April. We require a deposit of £70 to secure your booking.